Bartonella, a close phylogenetic relative of Brucella, are increasingly recognized as zoonotic human pathogens. Many are exceedingly hard to culture and only identified using sensitive molecular diagnostic techniques, leading to their under-appreciation in human disease. Interestingly, a large array of Bartonella species have adapted to infect and colonize mammalians hosts ranging from rodents to bats to cattle. In fact, they appear to be the most ubiquitous cause of chronic, systemic bacterial infection in mammals, approaching infectious prevalences of 90% in some host species. In contrast to Brucella, Bartonella are spread amongst hosts via blood sucking arthropod vectors. The pathogenic strategies that lead to such successful interaction with hosts and vectors is obviously of great interest. We have been exploring Bartonella pathogenic mechanisms using both in vitro and in vivo systems. It is believed that part of Bartonella's pathogenic strategy takes advantage of an unusual and productive interaction with endothelial cells, the cells that line blood vessels, and presumably contribute to the pathogen's ability to sustain chronic bloodstream infection. Indeed, some species in some hosts have the unusual ability to induce angiogenic tumors, a proliferation of capillaries associated with high local levels of bacteria (i.e., bacillary angiomatosis, verruga peruana, and peliosis hepatis). Therefore, we have been actively exploring the mechanisms and import of interactions with endothelial cells. Previously, my laboratory showed that Bartonella induces endothelial proliferation in two different ways, both as a potent inhibitor of apoptosis and as a mitogen. We also established the first in vitro model for Bartonella-induced angiogenesis (reviewed in ASM News, "Remarkably, Bartonella henselae Directs Angiogenesis In Vitro" ). Multiple additional studies are now underway to investigate how Bartonella manipulates endothelial cells and other attributes of the host milieu to its benefit. For example, we established a murine model for studying chronic Bartonella infection in which several important pathologies observed in human infection were recapitulated and are currently being studied. In addition, we have spearheaded a Bartonella genome project with the Broad Institute, Michael Kosoy (CDC), and several other Bartonella investigators to sequence the genomes of many of the established Bartonella species. Through use of comparative genomic analysis, this effort is expected to give the Bartonella field many additional insights into this fascinating group of organisms. Brucella pathogenesis is a more recent interest of the laboratory. We recently developed a type IV secretion system-dependent model of Brucella pathogenesis using Brucella neotomae, a species isolated from the desert woodrat. Postdoctoral fellow, Yoon-Suk Kang, created a versatile bioreporter toolkit to enable analysis of the fate of individual pathogens in polymicrobial infections. In contrast to wild type organisms, Brucella T4SS mutants were completely defective in their ability to growth inside of macrophages. Fascinatingly co-infection with Legionella pneumophila, another T4SS-dependent pathogen, was able to rescue intracellular growth of the T4SS-mutant Brucella and also stimulated growth of wild type Brucella organisms! This was a one way rescue: Legionella could rescue Brucella, but wild type Brucellla could not rescue T4SS-defective Legionella. An unpublished example of use of fluorescent proteins to study intracellular replication of bacteria and associated host cell death is shown below. 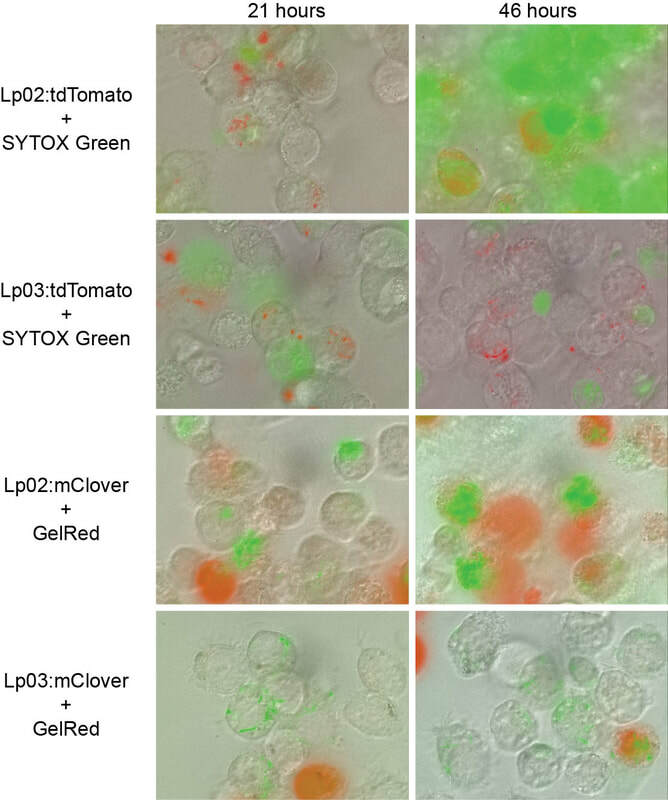 Use of red (tdTomato) or green (mClover) fluorescent protein labeling of wild type (Lp02) or T4SS-defective (Lp03) Legionella pneumophila. Lp02 replicates, kills and permeabilizes macrophages and allows fluorescent staining with color- complementary, impermeable, fluorescent nucleic acid binding dye (thereby identifying dead cells, killed as a result of wild type Legionella Lp02 replication), most notable after 48 hours of infection.